Dutch Chocolate will sire all our Sable kids for next season. We were excited to add him to our budding Sable herd as he combines a lot of the traits that the West Coast Sables have. He is long, tall, powerful, has a beautiful set to his rear legs with a ton of milk production in his pedigree. His full sister SG Joash PBB Chocolatetrifle who appraised FS-92 EEEE and was the breed leader for milk production milking 4300 pounds in 2014. His half sister, GCH Joash Thorn's Chocolate Eclair FS 90 VEEE, was the 2015 ADGA Sable National Champion in Oregon. Dutch Chocolate kids excel in width, depth, strength of bone and rear leg set. Dutch daughters have mammary systems with great attachment and we are seeing an improvement in height to the mammary system. To date (2018), a Dutch daughter has been in the top 3 at Nationals 13 times, including topping the class 4 times! Dutch to our knowledge is now the highest appraising Sable buck in the history of the breed at FS 92!! He is truly the cornerstone of our Sable breeding program. We so thank Elsie for sending us this great buck! We searched everywhere for a sable buck kid to reserve during the 2016 summer, with no success. Out of the blue, a friend calls us up and says "Ed, you've got to check out this Sable doe. She is the real deal." After three more people referred this doe and 7 months later, this boy arrived in the Midwest and we could not be happier. "March On" is crossing very well with our lines, and we admire the angularity and substance of bone he is adding to our herd. He sired TWO first place Juniors at 2018 ADGA National Show, including Kickapoo Valley OMOS Koalah the 2018 Junior National Champion! 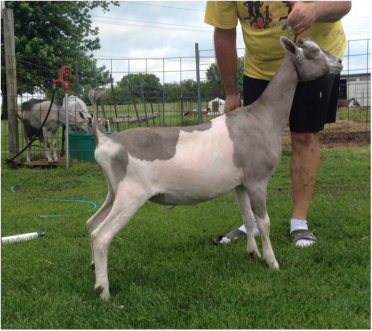 Additionally, he sired the 1st Place Jr Get of Sire at the National Show. We look forward to seeing the mammary systems on his daughters in 2018. Smooth was an unexpected addition, however we have long admired Jenifer Lawerence's strong Saanens and when she shot Cameron a message that she had a black buck available, we pounced on the opportunity. Smooth's granddam Secrets has been very successful in the Midwest, and has great milk production. We expect Smooth to throw good length and size as he is a very growthy buck.